As a native Floridian, Arianna has always had a love an appreciation for the unique ecosystem and state she was raised in. Her career started out at a small zoo in the Orlando area where she worked mostly with reptiles. 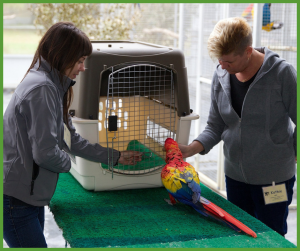 This is where she found her passion for training, enrichment, and animal behavior. There she worked with crocodilians, venomous snakes and many other animals. She found a deep interest in finding new ways to enrich them. Following her desire to learn more about behavior, she sought out a job with Natural Encounters, Inc. and was hired in January of 2009. She is a current general board member of IAATE and the chair of the Professional Development Committee. 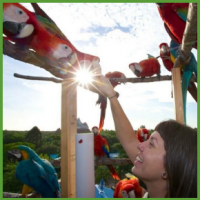 She also sits on the board for IATCB which is setting the standard and raising the bar for avian trainers around the world with the new Avian Certification Test and has been certified as a professional bird trainer (CPBT-KA) by the International Avian Trainers Certification Board. Always continuing her education, she has attended, presented and taught at workshops, conferences, and courses on animal behavior and the science behind it throughout her career. Her love of sharing information and teaching animals and humans alike is why she says she has one of the best jobs in the world.